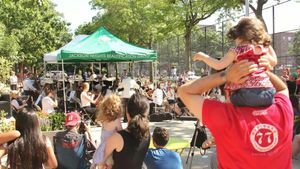 The Jackson Heights Orchestra kicked off the annual Summer Sundays at the Park concert series sponsored by the Jackson Heights Beautification Group. Originally published in Queens Chronicle. The Jackson Heights Orchestra kicked off the annual Summer Sundays at the Park concert series last week, drawing a crowd of people to the play street by Travers Park. The series, organized by the Jackson Heights Beautification Group, invites emerging and established artists to perform every Sunday afternoon for the community. Now in its 10th year, much has changed about the program for the better. “We used to hold it in the park and it was very difficult because we were dodging baseballs and tennis balls, and now for the past three years we have the benefit of the play street,” said Ed Westley, a member of the JHBG, adding that the bands who performed have changed throughout the years also, reflecting more of the neighborhood’s diversity. This year’s lineup includes dancers and singers from the Calpulli Mexican Dance Company and Los Colombian Roots. It also includes garage rock revivalist Sonic Power Pops and modern jazz duo Band in a Box, plus more. Last week was the first time the Jackson Heights Orchestra performed for the Summer Sundays, playing some songs that have a connection with the borough. “With the rich jazz history that Queens has it’s in proper order that we attribute quite a few of the numbers to Scott Joplin, Louis Armstrong, people like that,” said Patricia Glunt, founder and music director of the orchestra. It was not only Jackson Heights residents who came out to see the show. People from other neighborhoods also came, drawn to the idea of watching a great outside performance for free. “There are a lot of orchestras in the Upper West Side for hundreds of dollars, but this is more about the community than the image,” said Conner Concannon, who came from Astoria to watch the show with his wife. While the concert is free for everyone, JHBG urges residents to become members to help with the expenses of organizing the concert. In the past the concerts were paid for by a grant from the Queens Council on the Arts but the group missed the application deadline this year. Each concert costs about $1,000 to organize. “We’d like those who love our concerts, love the Jackson Heights Beautification Group, to take out a membership in our organization,” said Westley.